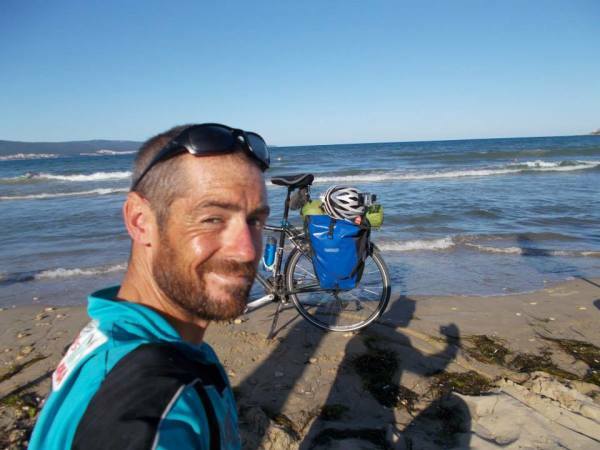 The world record setting cycle, row and climb across Europe to the top of Mount Elbrus! June 2015. It had been an almighty struggle to get to the start line atop Box Hill in Surrey. Rotten boats, money struggles, lack of prep in almost every form... it had been rocky alright but I was there. I was ready to go! I was waved off by my mum and my wife Louise as I clipped into my pedals and gingerely headed off. The boat had taken up all my time so this was the first time I had actually rode the Dawes with full panniers... It was heavy! The day did not go well really. I eventually made it to Dover despite the sat nav not working properly, teething problems with my setup and an all-round lack of practice, but I bedded down for an early ferry and vowed that would be it- I'd crack on from there! Well, it wasn't exactly an easy journey! The days were hot; VERY hot and with the lack of functioning sat nav the navigation was slow and often very wrong. I ended up following the Danube as although it wasn't direct, it did remove the need to navigate at all! Just follow the river! It meant that I could catch up a bit on mileage, knocking out a 140 mile day in the midst of it all. Things were looking up. I was in my groove, I met some wonderful people who selflessly went out of their way to help me and I was actually starting to enjoy the experience... until disaster struck. Numerous disasters later and It was June 2016. I had a new trailer. A new car. New co-drivers and vastly more experince in my boat Pacific Pete... no wait, i'd been out in it twice. Not even out at sea. WING IT! Anyway, Billy, Baz, Lou and I were off in Woody (Shogun) towing Pacific Pete and we made great time and had a proper laugh. Billy and Baz had previously rowed the Pacific Ocean so were great people to have along. 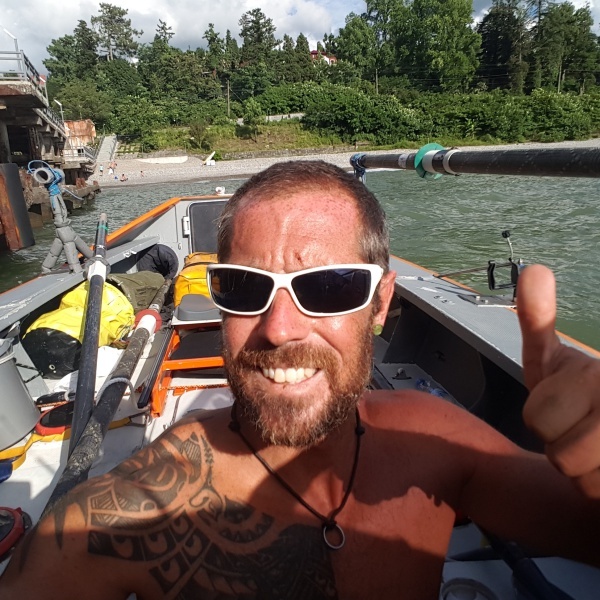 We got Pete in the water and along with some incredibly helpful people in Burgas who I am now honoured to call friends, got Pete loaded and set up. The three car mates then set off in Woody with an empty trailer on their own adventure(!!!) round to Georgia. After a few setbacks I had my weather window and I was off!! I was actually rowing an Ocean Rowing boat and I was in open water attempting to be the first person to ever row across the Black Sea!! It was exhilerating and just a tad daunting. Five days of getting used to the boat, battling with the 2 hours on, 2 hours off system (literally hated the 2am shift), making sure I was eating enough, trying to catch sleep in the day, navigating... then BAM!! The wind did an about face and there was nothing I could do. I deployed my para anchor and waited it out. I was tossed this way and that, getting incredibly uncomfortable in the little cabin, all the time plotting on the map my position and seeing all my hard work being undone. Worse than that was the wind was blowing me towards Turkey and I was running out of sea to retreat into! So this went on for EIGHT DAYS!! Then just as quickly as the wind changed from good to bad, it changed from bad to magnificent! I was away and creaming the miles out. I changed my shift pattern to rowing for 16 hours with only stops to eat and then at midnight I would settle down for sleep. I needed that divide between night and day. I needed to look forward to that sleep! On I rowed, finally enjoying the experience; having breakfast with dolphins playing around the boat, enjoying a cigar on calm nights gazing up at the crystal clear sky peppered with the lights of a thousand stars and getting the satisfaction of seeing my progress on my paper maps. I was truly loving my experience. After 29 days at sea I arrived in Batumi, Georgia. I hade done it! I had set a world record! There was even a TV crew there to interview me thanks to David who sorted everything out for me. In truth I just wanted a shower, a beer and some food that wasn't rehydrated! I had a few days to get Pete out of the water and make my way over the border into Russia. 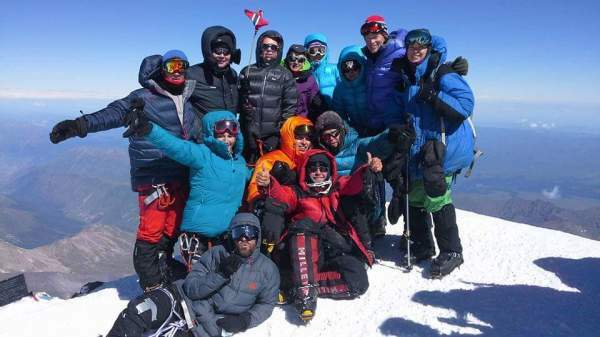 Here I met up with my guide Sasha and the other climbers in our group and we settled into our base camp at the bottom of Mt Elbrus; Europes highest peak! I had made it! It was great to be around other people and I had to apologise to Richard and Rebecca for having verbal diarrhoea as they were the first brits I had come into contact with! The climb was broken down so we could do acclimatisation hikes. These first few days I spent in shorts as the weather was sublime. Even when we moved up to our huts where we were finally in the thick snow, I stuck with the shorts. This didn't last though. Come summit day it was around minus 21 degrees. I had never worn so many layers and I felt cumbersome with my plastic boots and crampons. We set off in the early hours in the pitch dark. The headtorches formed a snake of shuffling light as we picked our way along the 'paths'. A walking pole in one hand and an Ice Axe in the other, we slowly made our way taking time to turn and take in the breathtaking sunrise behind us. We stopped for a break and I found that my breath had frozen my snood to my jacket! I had to use the steam from my coffee to thaw it out! Hours later we found ourselves on top of the peak - 5642 metres above sea level. We were literally looking down on everyone in Europe. It was a moment to savour for all of us standing there and taking in the view and taking stock of what we had achieved. For me it was a release. After all the hard work, the ups and many downs, the time away from my wife and the money struggles I had bloody well done it. I had achieved what I set out to do and what many people said I wouldn't do. I was overwhelmed as we quickly made our way back down the mountain to warmer and more breathable air! Just days later I was sat in Tblisi airport waiting for my buddy Rudy to arrive from the UK. He had flown out to help me drive Woody and Pete all the way home. It was amazing to see a friendly face. For all the new friends I had made, nothing is quite like a taste of home. We headed out for a beer or two (it was 3am after all) and made a good go of drinking Tblisi dry. Soon we were reunited with Woody and Pete back in Batumi and set about the the long drive home. Wow, it was tough going! Europes idea of a large coffee didn't help and the border police having their suspicions of our intentions (they clearly thought we were drug smugglers) added to the story, but like true warriors we battled on and got back to the UK the day before we were due at work.